I'd like to thank all of the readers of this blog for their interest and loyalty. As the following plots illustrate, the blog seems to have a core audience of about 50 people who tend to view about two pages on the site per day. 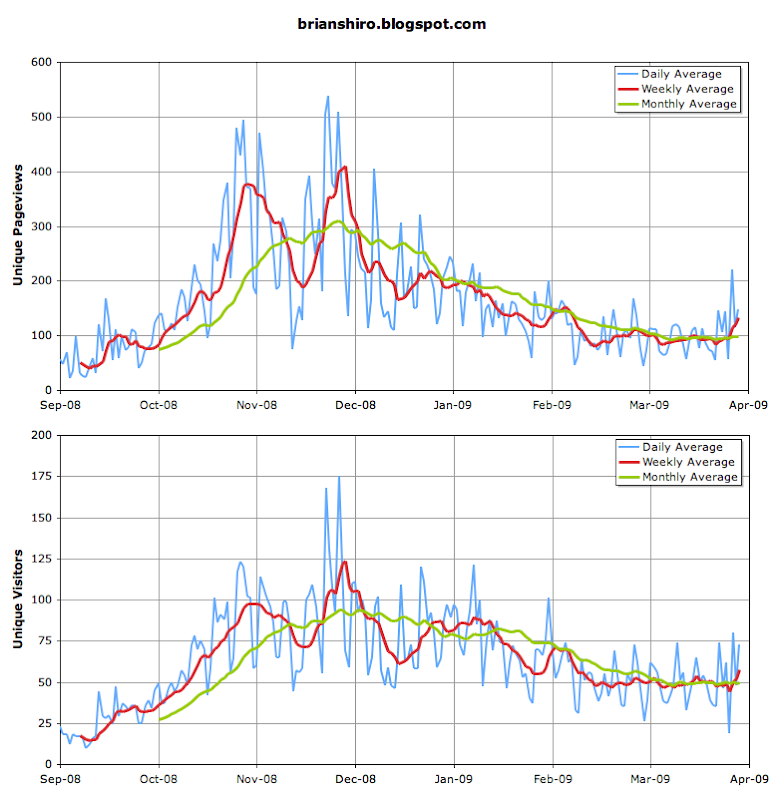 During the blog's height in popularity from November to December 2008, these numbers were about 2-5 times greater than their current values. The initial upsurge the blog's popularity began in November 2008 when I made it to the highly qualified stage of astronaut selection. The next peak during December 2008 corresponded with popular posts related to astronaut interviews and my comparison of ISU vs. UND. The daily popularity of the blog waxes and wanes depending on when I have substantial posts. However, there has been an overall decline in readership since early January 2009 when I announced that I wouldn't be advancing to the interview stage. Interestingly, there has been an upsurge in popularity this past week with my post about the status of the 2009 ascan selection. I've also registered the blog with technorati and Facebook, which may have given it greater visibility. I expect bumps in readership to happen in the future when I will post about the final astronaut selections and finally get my full-blown astronaut statistics posted, which uses a much more expansive dataset compared to an older post on astronaut statistics. My goal is to keep this blog as a one-stop-shop of information relevant to astronaut hopefuls. I'll continue to provide posts that I find interesting and relevant to fellow aspiring astronauts. If anyone wants to offer suggestions for improvement in terms of content, design, posting frequency, etc., please let me know either by commenting to this post or contacting me. On occasion I also welcome guest bloggers, like I did with the Project Manhigh post. Current astronaut candidates and astronauts are particularly encouraged to contribute, as I'd like to keep an edge by having access to some degree of timely insider information. I receive emails from people all of the time praising the blog. One reader (a university biology professor) even wrote to me saying she and her students routinely follow it in their classroom. To everyone who follows this blog, I am humbled by your interest and continued feedback. Thank you and ad astra! I am one of your regular readers. Thank you Brian for an interesting site. I am looking forward to your full-blown astronaut statistics.